The age of democratized human genomics is coming. 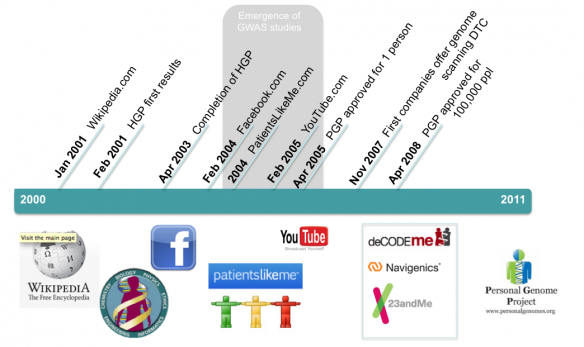 Bioinformatics and genomic data analysis startups are emerging everywhere in Silicon Valley. These companies are in a race to turn your genes into personalized and public web information the same way Facebook has done to your identity. With genomic sequencing getting more affordable with time, companies like 23andme and Counsyl (among many others) are starting to exploit the next layer of information personalization. Back in 2007, a 23andme genetic test to map your entire genome used to cost $1,000, now it is only ~$300. Information is power, as Google has proved; and consequently 23andme was co-founded by Anne Wojcicki, who is married to Google co-founder Sergey Brin. Current healthcare is focused on post-illness treatment, bioinfomatics will give users the power to know behorehand about their genetic-predisposed diseases so they can prevent them. All of this, for the benefit of science, since for every user’s genomic data they map, it will serve as a data point in their research to discover other genomic diseases. However, with the recent concerns in web privacy, will consumers risk their private health information, or even want to know in advance about their genetic predispositions? This is an interesting trend we are waiting to tell you about. The first video below shows you a general picture of where bioinformatics is heading, the last video will give you a more in depth idea of what genomics is. 23andMe is a privately held personal genomics and biotechnology company based in Mountain View, California that is developing new methods and technologies that will enable consumers to understand their own genetic information. The company is named for the 23 pairs of chromosomes in a normal human cell. ideas that you are It must be quite a lot of work to keep your blog so nice and neat! I heard a lot of information about 23andMe it includes how accurate their results are. It’s my first time to do my genetic testing and I am very excited with the results as well.